I woke up this morning hoping that last night’s memories of Facebook were a bad dream. No such luck. If you are just an occasional Facebook user or only log in once a day, brace yourselves for the new experience that is “New Facebook”. Here in the UK the changes started to roll out yesterday afternoon. The first thing I spotted was what looked a Twitter stream in the upper right hand corner of the screen. Interesting, I thought, I don’t direct my whole Twitterstream to Facebook anymore so what is it doing there. On closer inspection it turned out to be a streaming feed of Facebook updates from my friends. I actually quite like this. Hover over one of the updates and you see any associated comments and conversations. It is also very easy to scroll down through the list and catch up with the latest news from your friends and pages. Below that box are my events and below that….nothing! No adverts, no photo updates from friends. Apparently the absence of adverts depends on what system you are using. Phil Bradley has reported that they are visible on his desktop computer but not on his laptop. (Phil Bradley’s weblog: New Facebook, new disaster http://philbradley.typepad.com/phil_bradleys_weblog/2011/09/new-facebook-new-disaster.html). As I only have laptops here I can’t compare and contrast but I’m sure that Facebook will ‘fix’ the missing adverts problem fairly soon. What was puzzling me was why is there an update feed on the right hand screen as well as in the main middle part of the screen? The answer is because Facebook has started messing around with how it presents the updates. Top Stories are back and very much in evidence, not as a separate link but actually inserted into the top of the feed. As with the previous incarnation there is no clue as to what criteria are used to decide which humble updates becomes top stories. I was delighted to see, though, that the first one in my news feed was a complaint about the new interface! This was quickly followed by two more in similar vein. You can get rid of them individually by clicking on the little blue corner in the upper left hand corner of the story but there is no way of removing them altogether. This is a really bad move by Facebook and one that I suspect is going to seriously annoy people. At least I am viewing all of the updates from all of my friends, aren’t I? It turns out I am not. Some of you may recall that a while back Facebook decided to show updates only from those people with whom you interact most. Another not-so-smart move by Facebook. I am sure that many people do as I do and follow people and organisations just to keep up to date with what is happening and rarely comment or “interact” with them. That does not mean I am not interested in what they are doing. There used to be an edit option at the bottom of your feed where you could change the default to see all updates. I checked the new version of the feed and there is still an Edit options link but this now only gives you the ability to hide posts from a person, page or group. Therefore I assumed that everything is automatically appearing in my news feed. It isn’t. Hover over the name of a person in your feed and a box pops up showing their avatar, mutual friends and two ticked buttons labelled Friends and Subscribed. When I clicked on the Subscribed option I saw that I was getting “Most updates”, not all. I mostly use Facebook to keep up with close friends and family and there are times when it is important that I receive ALL updates. I have not yet found a way to change this setting for all of the people I follow on Facebook; it has to be done one at a time. I can understand that one may not want to have the same setting for all friends so an obvious solution would be to have an option associated with lists. This brings me to my final disaster in New Facebook. I have been playing around with lists in Facebook for a couple of months and was pleased to read that New Facebook was to implement a much easier way of managing them, much in the style of Google+. New Facebook displays its own default list names, such as Family and Close Friends, on the left hand side of the screen and suggests who you might like to add to each one. Most of these suggestions are nonsensical. You can create new lists of your own but what about existing lists compiled under Old Facebook? Can they be incorporated into one of the default lists or form the basis of a completely new one? Mine can’t because they have vanished into thin air! I have no idea where they have gone, the help files are useless on this and no-one else seems to have experienced the problem. I am rebuilding my family and ‘important people’ lists but I can’t be bothered to go any further than that. And there is no option to change the Subscribed options for a whole list. If there is it is very well hidden. Overall I do not like the changes and find some of them infuriating. I shall probably now be using Google+ a bit more, but some of my close friends and family are only on Facebook so it looks as though I shall still have to visit at least once a day. I do so under protest. The University of the West of England (UWE) hosted the UKeiG 8th September workshop on business information. The list of participants included people from academic libraries, public libraries, the legal sector and freelance researchers. The day got off to an interesting start with one of the participants telling me that a colleague of theirs thought there wasn’t any quality business information on the web! I hope I proved them wrong. Some of the materials provided on the day can be found on my web site at http://www.rba.co.uk/bi/. Please note that SocialMention, which is mentioned in the latter part of the PowerPoint presentation, has been down for nearly five days and we have to assume that it is “no more”. [Update 10th September: after nearly a week offline SocialMention is now back online]. Those of you who have attended my Google, general search or business information workshops will know that towards the end of the afternoon I always ask the group to come up with a list of top ten tips. These can be useful sites that they have discovered during the day, essential services that they already use or commands that help focus the search. A combined list of tips from previous business information workshops is at http://www.rba.co.uk/bi/TopBusInfoSearchTips.pdf. Below, in no particular order, are the new tips from the 8th September workshop. 1. Biznar http://www.biznar.com/ Biznar is a federated search engine that runs your search in real-time in about 80 resources. There is a list on the Advanced Search screen where you can deselect individual or groups of resources. Many of the workshop participants de-selected Google Groups, which seemed to their dominate results, and some went as far as to exclude the whole Blogs and Social Networks group. The results are combined into a single list and on the left hand side of the scree are organised into folders such as Topics, Authors, Publications, Publishers and Dates. These are computer generated but can help you narrow down your search. 2. Export.gov http://export.gov/“Helping U.S. companies export”. Information on markets and doing business outside of the US. As the strap line of the web site suggest this is aimed at US companies but the reports contain information that is relevant to anyone looking at external markets. 3. Guardian Data Store http://www.guardian.co.uk/data Visualizations and mashups of data relating to major stories in the news. Links to the original datasets are provided so that you can download the raw data. 4. Company Check http://www.companycheck.co.uk/and Company Director Check http://company-director-check.co.uk/. Both services use Companies House data. Company Check provides 6 years of figures and graphs for Cash at Bank, Net Worth, Total Liabilities and Total Current Liabilities free of charge and lists the directors of a company. Click on a director’s name and you are taken to the Company Directory Check – launched last week – where you can view other current and past directorships for that person. 5. Companies House http://www.companieshouse.gov.uk/. The official registry for UK companies. Services such as Company Check and Bizzy (http://bizzy.co.uk/) may provide more information free of charge but it is always worth double checking with Companies House to see if there is more up to date information. The list of documents available for a company in combination with the free services may be enough for you to make a decision on whether or not to do business with that company. Use the free WebCHeck service to locate the company in the register and then click on “Order information for this company”. You will then see a list of available documents: titles such as “Struck off and dissolved” followed by “Application for administrative restoration” might suggest that you should run a mile! 7. Applegate directories http://www.applegate.co.uk/ A collection of business directories for electronics, engineering, plastics, rubber, chemical, oil, gas and recruitment services covering the UK. Recommended for generating lists of companies by location. 8. Kompass http://www.kompass.com/. Well established directory with world-wide coverage (some of us can remember the black, hard copy volumes!) Search is free and some results are free. Pay as you go options are reasonably priced and there is extensive country and industry coverage. 9. Public libraries’ databases and resources. A reminder from the public libraries contingent that you can access their resources free of charge for personal use from your desktop using the identification on your library card, for example NewsUK and the The Times Digital Archive. 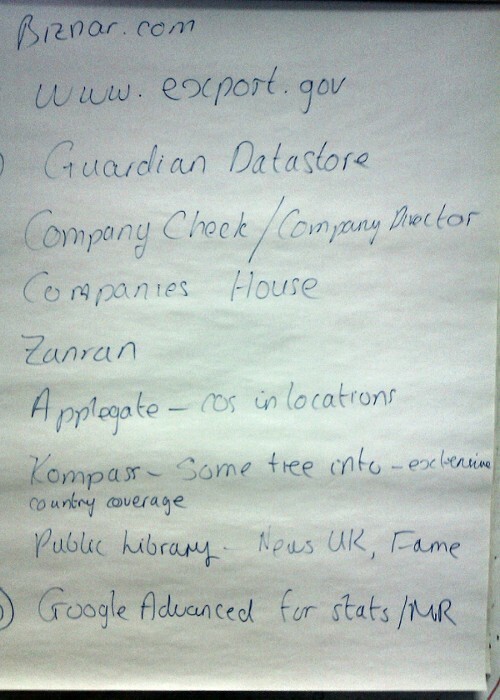 Some library authorities also provide access to business databases. 10. Google Advanced Search Use the advanced search screen or commands to help focus your search on statistics and market research. For example use the ‘filetype:’ command to search for spreadsheets containing statistics or PDFs of industry/government reports. Use ‘site:” to focus your search on academic or government sources, for example site:ac.uk. Many of us have known for a while that the search engines, and in particular Google, customise results. What you see on your screen will not necessarily be what someone else sees on theirs even with what appears to be an identical search. Location, browser, search history, your browsing behaviour and your social networks are just some of the factors that are used by Google to personalise your results. I recall sitting next to Marydee Ojala at a business information conference in the Czech Republic in 2008 and under discussion was a search visualisation tool. We both ran the same search – Czech coal production, I think it was – and from the maps that were generated on our screens it was obvious that we had completely different sets of results. Marydee had what we decided was an “unadulterated” set with pages that did include the keywords but were not exactly on topic, for example a report on a local football match sponsored by Czech Coal. In contrast, my results were mostly Czech coal production statistics and news on the energy sector in the region. I regularly research the European energy sector and the search engine underlying the visualisation tool used my search history to adjust the results accordingly. The first of my updated guides and one new guide covering social media and collaborative tools are now up on http://www.rba.co.uk/web2/. I use these guides in some of my social media workshops and they are intended to help people get started with the various tools. You will notice that there are two Getting Started with Blogger guides: one for the old interface and one for the new. Don’t worry if you have not seen the new version of Blogger – Google is rolling this out gradually so it may be a while before the option appears on your screen. The guides are Word documents so that you can edit them for use in your own organisation. I have given them a Creative Commons Attribution-NonCommercial 3.0 Unported License but if you are not sure whether your use of them will be covered by that license do get in touch with me.